(Nov 11): Wall Street ended marginally lower on Friday, with losses in Intel and Apple as investors worried about the future of promised corporate tax cuts following dueling plans unveiled by Republican lawmakers. The S&P 500 and the Dow Jones Industrial Average ended the week lower for the first time in nine weeks. U.S. Senate Republicans released a tax plan on Thursday that differed from a version put forth by the House of Representatives on several key fronts, including putting off corporate tax cuts for a year. Expectations of lower taxes, one of President Donald Trump's key campaign promises, have helped drive the S&P 500 up 20 percent since the 2016 presidential election. Failure to cut corporate taxes would increase concerns about Trump's ability to pass legislation and could shake markets that have been banking on lower tax rates to boost company earnings. The S&P 500 on Friday stood at 18.1 times expected earnings, the highest since 2004, according to Thomson Reuters Datastream. Arrow Funds Director of Research John Serrapere put the chances of successfully passing meaningful tax cuts at 50 percent, and he warned that failing could trigger a correction of as much as 15 percent in stocks. "There's not a lot of confidence. I'm not pessimistic, but there are a lot of pieces that need to be put together," Serrapere said. The Dow fell 0.17 percent to end at 23,422.21, while the S&P 500 slipped 0.09 percent to 2,582.3. The Nasdaq Composite edged up 0.01 percent to 6,750.94. 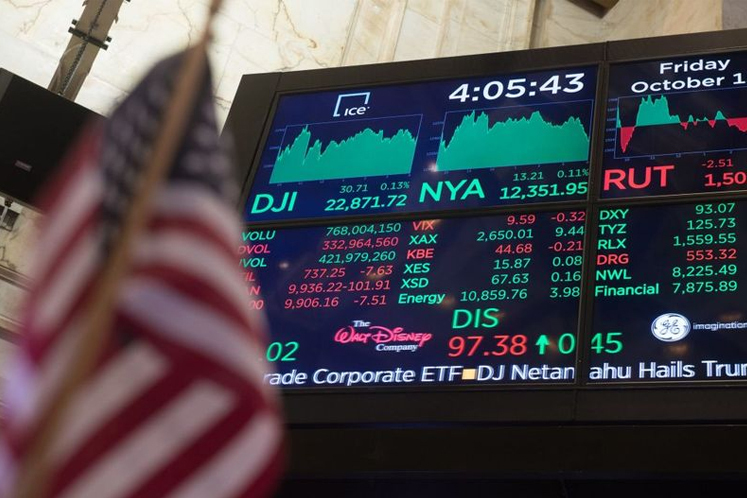 For the week, the Dow lost 0.5 percent and the S&P 500 slipped 0.21 percent. The Nasdaq gave up 0.2 percent for the week, snapping six weeks of weekly gains. Intel fell 1.55 percent and Apple lost 0.33 percent, both accounting more than any other companies for the S&P 500's decline. Seven of the 11 major S&P sectors fell, with the energy index's 0.81 percent dip leading the decliners as oil prices fell. Nvidia jumped 5.27 percent and hit a record high after the chipmaker's revenue forecast for the current quarter topped estimates. A rise in media stocks also helped limit the slide. Disney rose 2.05 percent as the promise of a new "Star Wars" trilogy overshadowed its weak quarterly results. Time Warner Inc jumped 4.08 percent while News Corp climbed 5.15 percent. Declining issues outnumbered advancing ones on the NYSE by a 1.31-to-1 ratio; on Nasdaq, a 1.08-to-1 ratio favored advancers. About 6.4 billion shares changed hands on U.S. exchanges, below the 6.6 billion daily average over the last 20 sessions.